The 7 most inspiring things to do and see in Marrakech without the crowds. Marrakech is hot! It looks like every Instagrammer and tourist just wants to be here. And I'm not surprised. Marrakech is truly something unique. 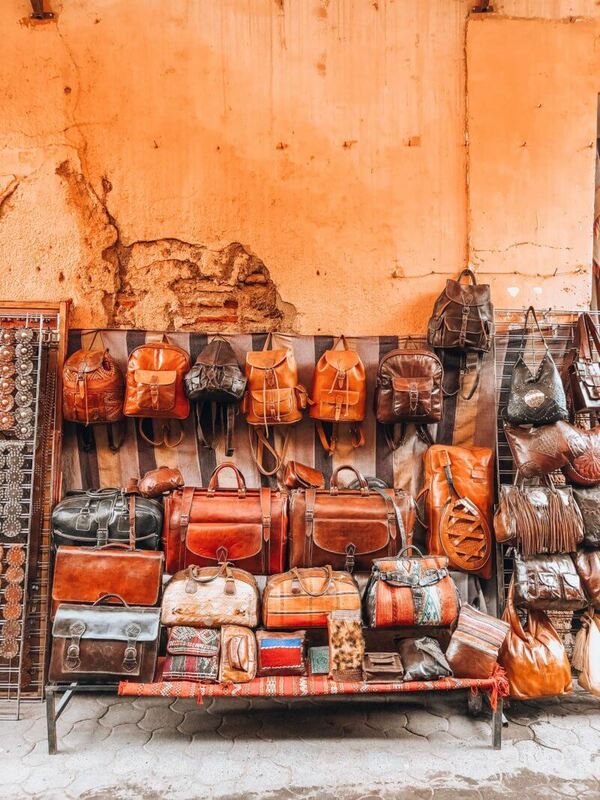 This colorful city in Morocco gives you the feeling of stepping into Aladdin's cave. But it's popularity comes with a price. Standing in line for an hour to get tickets to the Majorelle Gardens or trying to find a table in that one favorite restaurant are things to do in Marrakech that everyone writes about – and recommends. So the question is, what are the things to do in Marrakech without the crowds and off the beaten track? Ben Youssef Madrasa: You simply can't miss this beautiful old koran school. Although this place is very popular it's also quite big. Try to go early in the morning or at the end of the day to enjoy its beauty. Drink mint tea with Moroccan pancakes at Cafe des Epices: A perfect place to take a little break and watch the people go by. The Moroccan pancakes are super delicious here! If you really like some peace and quiet head over to the rooftop and enjoy the view. Visit the Spice Souks: Unlike the overcrowded Jemaa El-Fnaa square this little Place des Epices is way more relaxed. Colorful spices everywhere and some very nice rooftop restaurants to choose from. Probably one of my favorites places in the city. 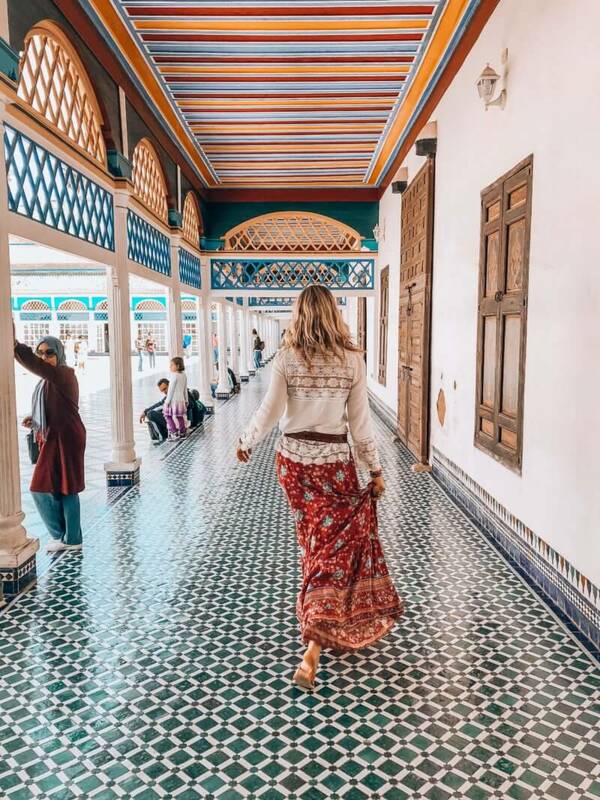 Bahia Palace: If you only have time for one place to see in Marrakech, this is the one. This stunning palace in the south of the Medina will steal your heart. After paying a small entrance fee you enter the palace through a lush garden. It may seem crowded here, but no worries. After this garden, everybody will spread out over the entire grounds and disappear. Great place to take pictures! Eat at Dar Marjana: instead of eating where everybody is eating go somewhere new! This restaurant is a more fancy option and the food is just superb. One the first floor they serve a Morrocan dish including music and entertainment, but if that's not your cup of tea go to the second floor where you can enjoy in silence 🙂 Don't forget to try some Moroccan wine when you're there. Take time to relax from a rooftop: When you book your hotel or Riad make sure they have a rooftop. Seeing the city from above is so relaxing! Especially after a day of sightseeing and shopping, it's very nice to just do nothing for a few hours and watch the sun go down behind the mountains. Marrakech stole my heart upon our first meeting and I’m happy we’ve met again since our first date. Besides the many awesome things to do in Marrakech, there are also beautiful Riad’s that are worth your attention. My absolute number one place to stay in Marrakech is the mind-blowing Riad be Marrakech. The owners, Mo and Nicole, are absolutely lovely and make you feel right at home. 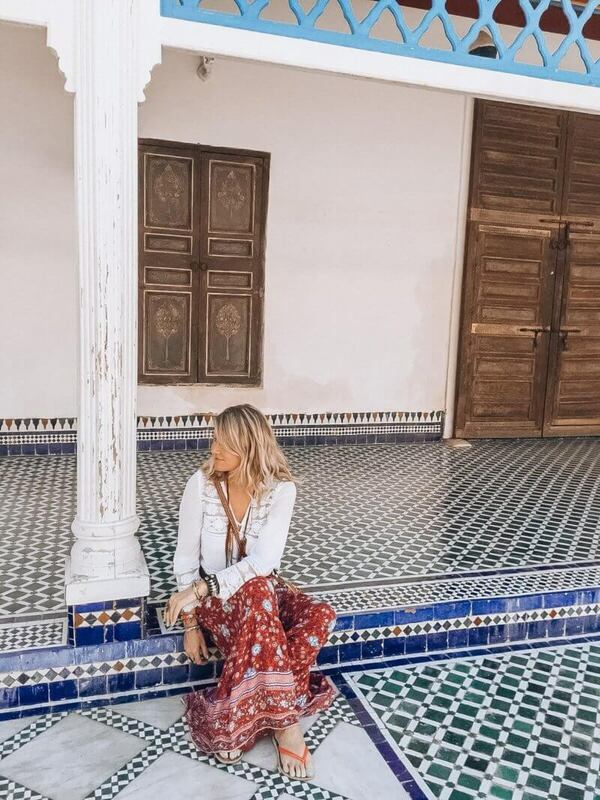 When you choose to stay in Riad be Marrakech you’ll say yes to an incredible stay in the middle of the Medina in an authentic Moroccan accommodation with an ambiance that makes you never want to leave again. Also, the incredible rooftop offers an amazing view of the city. Have you been to this beautiful city already? Let me know what your favorite places were! Would love to hear from you! we love Marrakesh. we’ve been for new year for the last few years. unfortunately we haven’t stayed in a riad because we take our young teenage daughter and my mum, so we need the entertainment the big hotels provide and also I’m disabled and my mum is in her eighties so we need lifts. hopefully though next year for my 60th just me and hubby are going to stay in a riad. we will hopefully find one with a lift. 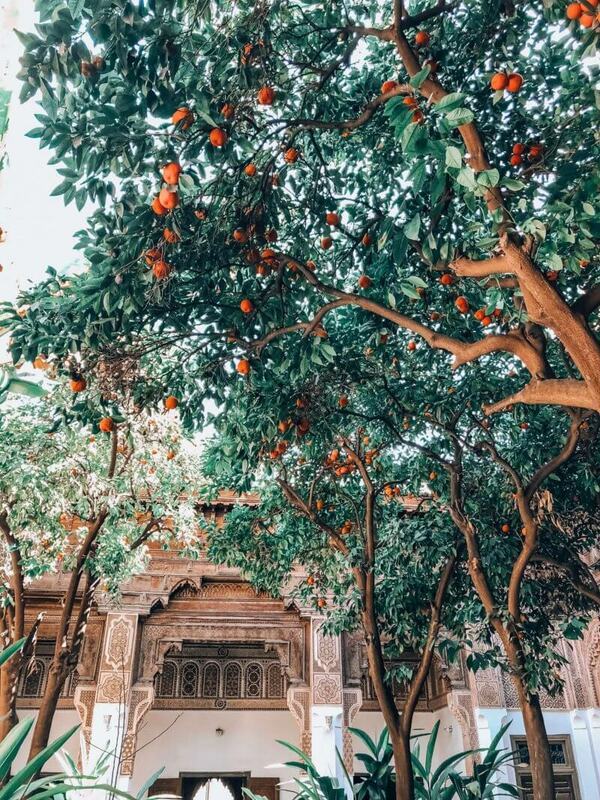 we just love the atmosphere and hustle and bustle of Marrakesh. i also love the décor. I’m quite hippy and bohemian. our flat has a lot of Moroccan décor and i love it. So glad you love Marrakech too! Staying in a riad is an absolute must, but I understand that finding one with a lift can be a challenge. I really hope you get to spend your 60th birthday there! 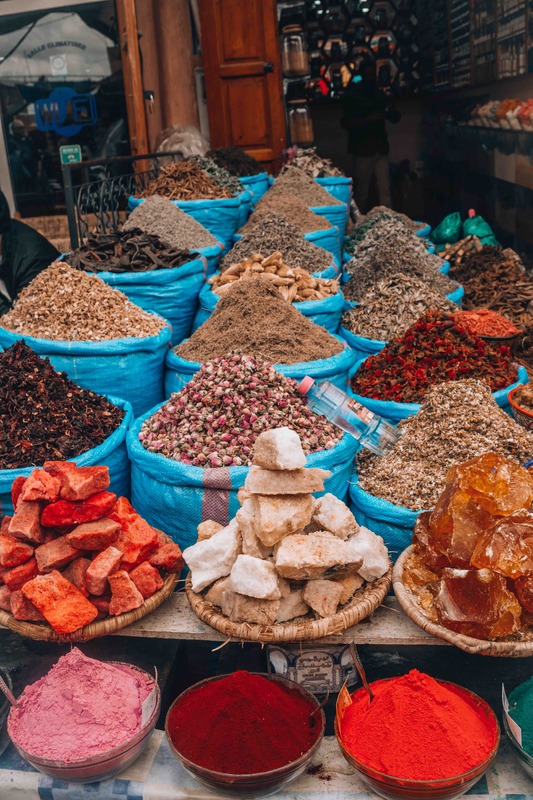 I’m going to Marrakech in September, and I loved your article, it was very helpful! I wanted to ask you if you know of any places in the city where I can ship things internationally? I live in Texas and I know there’s going to be many things I’d like to buy, but I won’t be able to fit them in my bag or on the plane! My husband is Moroccan so we visit Morocco often (not often enough!). He’s from Rabat so I’m most familiar with that city. We’ve been to Marrakech in December. Beautiful city! Jardin Majorelle is one of my favorite places to enjoy some peaceful time. It may be busy with people but I find the garden truly a delight. There is a small cafe there too. The Manara Gardens is also a peaceful place to walk around the huge reflective pool and see the tiny palace built in the 1800s. The olive grove outside the complex is also very peaceful to have a picnic in. Beyond Marrakech there is a road through the Ourika Valley with river side cafes that are very peaceful and easy to get to from Marrakech. It’s a beautiful country with gracious people!